The UltraStik 360 is an arcade style analog joystick. The Quadstick Manager Program can relay its position to the Quadstick over a USB or serial connection, where it can be used as a second joystick. Plastic enclosure only, machined for the UltraStik 360 for $35 . Please note the $35 variant does NOT include an UltraStik 360 device. The enclosure is a polycarbonate case, approximately 4.6" square and 2.5" high, with a CNC milled opening for the UltraStik. Up to two UltraStik 360's can be used in combination with the QuadStick at the same time. The XY position of the UltraStiks can be used in a Game Configuration file just like the Mouth Operated Joystick position itself. This allows a user with some arm movement to map an UltraStik as one of the Analog sticks while the using the mouthpiece as the other. The UltraStiks and the QuadStick must all be connected over USB to a Windows PC running the QuadStick Manager Program. The QMP relays the data from the UltraStiks to the QuadStick, where it is used in a game configuration. The output from the QuadStick can be used by the PC or through a CronusMax, to a game console. See below for a wiring diagram. A single UltraStik can be connected directly to the USB-A connector on the back of the Quadstick, but a CronusMax or Brooks Super Converter may be required for the PS4 or XBox One. A PS3 or Nintendo Switch can be used without any converters. If you choose the enclosure only, the UltraStik 360 can be ordered from Ultimarc's online store. They offer two different hand grips, a red ball and a black oval. 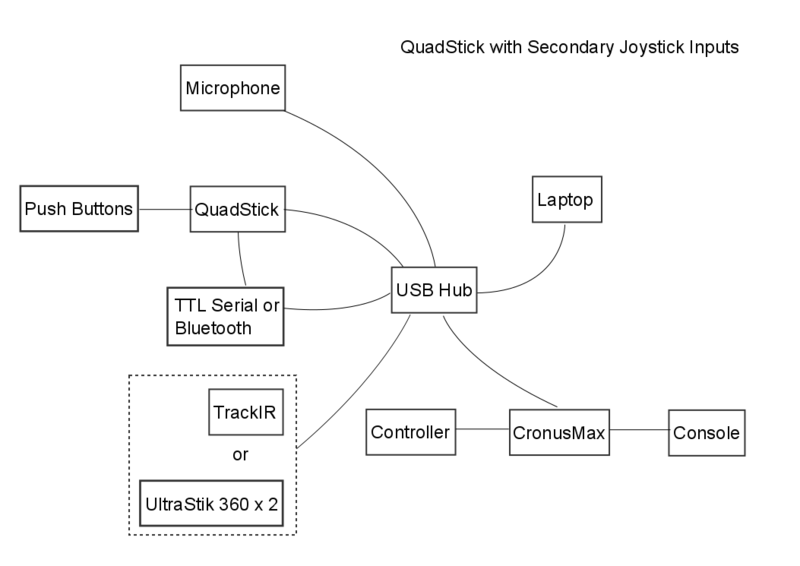 Wiring block diagram showing how the QuadStick and UltraStiks connect through a PC to a game console.